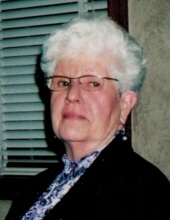 TERRE HAUTE- Delores Ann Ingram Leonard, 83, of Terre Haute, Indiana passed away at 5:21 pm Tuesday, January 29, 2019 at Springhill Village in Terre Haute. She retired from the Apple House in Terre Haute with 23 years of service. She was also employed by Meis Department Store in the Meadows and Honey Creek Shopping Centers. She was born January 17, 1936 in Scottland, Illinois to the late Forrest Ingram and Thelma Frazier Ingram. Survivors include three sons, Brad Camerer of Terre Haute, Norm (Lynn) Camerer of Rockville and Roger Camerer of Marshall, Illinois; one daughter, Bonnie Walton of Granby, Colorado; one brother, Elton (Elsie) Ingram of Chrisman, Illinois; sister in law, Patty Ingram of Brownsburg; seven grandchildren, Jennifer Camerer, Clint Camerer, Matthew Pine, Leslie Camerer, Michael Pine, Joseph Pine and Evan Walton; several nieces and nephews. She was preceded in death by a son in law, Brian Walton and two brothers, Glenn and Paul Ingram. She was a graduate of Scottland High School and in her younger years enjoyed showing five gaited step horses. Memorial services will be 11:00 am Saturday, February 2, at Gooch Funeral Home, 112 W. Howard Street, Rockville. Memorial visitation will be from 9:00 am until 11:00 am Saturday. Inurnment will be at Wesley Chapel Cemetery in Scottland, Illinois. Memorials should friends so desire, may be made to Heart to Heart Hospice, 4529 S. 7th Street, Terre Haute, IN 47807 in her memory. To send flowers or a remembrance gift to the family of Delores Ann Ingram Leonard, please visit our Tribute Store. "Email Address" would like to share the life celebration of Delores Ann Ingram Leonard. Click on the "link" to go to share a favorite memory or leave a condolence message for the family.